At the very beginning of this post, I want to give credit to following two online courses. What I learnt from these courses, converted in this post. It transform the DOM elements. In simple words, using directives we can modify the behavior of a particular DOM element or add new custom element on the DOM. For example ng-show is a directive. It modifies behavior of an element that whether that element will be visible or not. We are using built in directive ng-show to amend the behavior of the div. First div will be visible whereas second div won’t. On the view custom directive myFirstDirective can be used as shown in below listing. As you see we are using the custom directive with various combinations of dash, underscore, and colon. For angular all three options are exactly the same. In the chrome browser developer tools on selecting inspect element option, you can see that the directive template has been replaced with the html. Custom directive can be used on the view in four different ways. Out of these four methods, as an attribute and as an element are widely used. In older version of some browsers comment and class ways of using directive can be used. In the DOM if we want to replace the custom element that can be done by setting the replace option in the custom directive. Let us modify the studentDetail directive by setting the replace attribute to true. When we create complex custom directive, template as a string could be tough to handle. We can have template in external HTML file and can be loaded using the templateUrl attribute. We can move the template in the external HTML file which must have the same name as of the directive. So let us add studentDetail.html file in the application and move template string the HTML file. Let us go bit creative and use bootstrap to make the template more immersive. I am using the bootstrap panel. Using the ng-show directive, we are hiding/showing the subject div. The problem with above approach is that the click event reside in the parent controller than being part of the directive. Hence it violates the rule of encapsulation. In idea scenario we will like to have click event function as the part of the directive. In the browser application will render exactly the same as it was running when the setGrade function was part of the controller. Default scope is the shared scope. So far we have been working with the shared scope. In the shared scope, the directive share the scope of the controller, in which it is enclosed it. Let us again consider the example used previously, studentDetail directive is enclosed inside the studentsController. By default studentDetail directive have the same scope as of the studentsController. In the Google chrome developer tool you will find that id of both the $scope are the same. 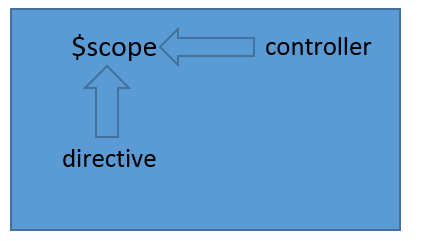 In the shared scope the directive shared the scope of the controller it is enclosed in. Shared scope can be depicted by the next image. 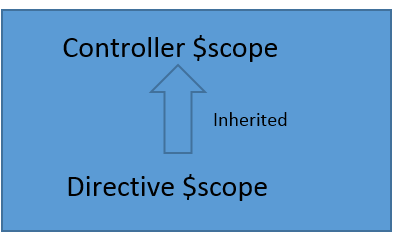 As you see that $scope object is being shared in between the controller and the directive. If in the directive we change data on the $scope object, it would be reflected to the controller. In shared scope data attached to the $scope can be changed in the directive and it would be visible in the controller. Other option is directive can inherit the scope of the controller it is enclosed in. In this case scope of the controller will be visible to the directive whereas directive scope won’t be visible to the controller. The controller scope becomes the parent of the directive scope. Inherited scope can be set by setting the value of scope property to true as shown in next code listing. In the Google chrome developer tool we will find that id of directive $scope and the controller $scope are different. However if we examine parent of the directive child scope, we will find that if of the parent is set to the id of the controller scope. In the browser application will be rendered as shown in the next image. No point to guess that all four entry of directives are using the same data from the controller. We have created isolated scope for the directive. Now scope is not shared in between the directive and the controller. At this point, on running the application we will find that data is not displayed in the application because scope is not shared. By diagram let us try to understand shared and isolated scope. Now the question bin front of us is that, in isolated scope how to share the data from the controller to the directive? In Isolated scope data can be shared using the local scope property. Directive with the isolated scope can talk to the outside world using the local scope properties. There are three options in local scope properties. The @local scope property can access the string from the outside the directive. Using the @local scope property string value can be passed to the directive. In the directive student.name from the studentscontroller can be used. We are passing data to the directive as the string. If we change value of student name in the controller, directive will be updated. However any change in the directive local property will not make any change in the controller. Character = local scope property is used to pass object to the directive from the outside world. It also supports two way binding. We have added more students to the $scope. This is pretty straight forward controller. We are going to use this controller to understand the local scope property =. 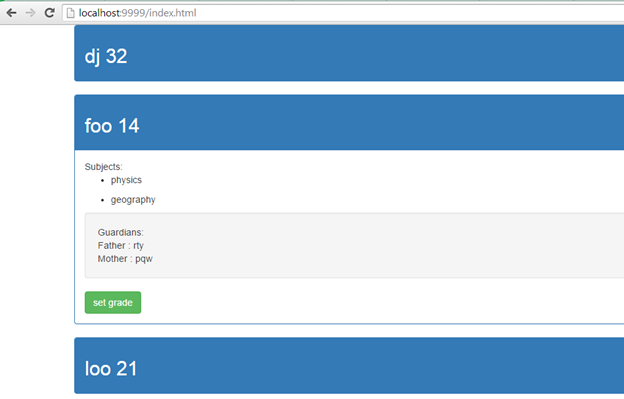 I have also modified the template in studentDetail.html as shown in below listing. 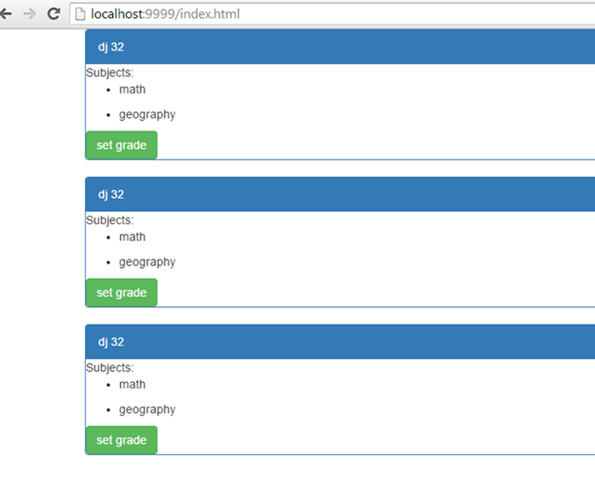 On running the application in the browser, we will find that data of three different students have been rendered. Now when you set grade of one student, another students will not get impacted. Add ng-click directive on the panel header. When user click on the header function will be called in the directive controller. Add ng-hide directive to the panel body. On clicking of the panel header panel body will be either collapsed or expanded. Let us start with adding the ng-click and the ng-hide directive. Next in the directive we need to add hide() function and isHidden data to the $scope object of the controller which is the part of the directive. We notice that studentDetail directive is getting large. As application grows, it will be tough to manage a too big directive. Let us go ahead and take the guardian data and move it to a separate directive called studentGuardian. 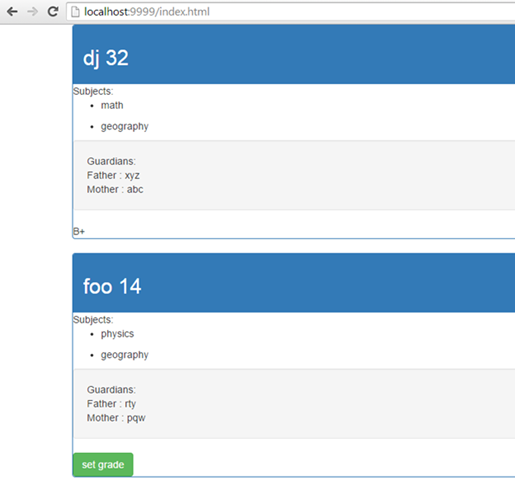 Now we have a nested directive studentGuardian inside the main directive studentDetail. And the studentGuardain directive working with the shared scope. We got a similar kind of requirement to expand and collapse the guardian section. Let us start with adding ng-click and ng-show to the studentGuardian directive template. Now we have two div on the studentGuardian directive template. One will be displayed when in the expanded and other in the collapsed mode. Value of scope property is set to true. On running the application in the browser, we will find that now guardian can be expanded and collapsed separately. If we change the value of scope to false then when we click n guardian the whole panel will be collapsed/expanded since the isHidden variable is shared in the shared scope. In this post we learnt about directive, custom directive, and scopes in the anularJS. In next post we will focus on decorator directives, link function etc. I hope you find this post useful. Thanks for reading.